On Oct. 5, 2008, roughly 15.6 miles (25 kilometers) from the surface of Enceladus, NASA's Cassini spacecraft captured this mosaic of this geologically active moon of Saturn. The area depicted shows many fractures, folds, and ridges — hallmarks of remarkable tectonic activity for a relatively small world. The icy moon's well-known jets emanate from at least eight distinct source regions, which lie on or near the tiger stripes visible along the terminator at lower right. However, in this view, the most prominent feature is Labtayt Sulci, the approximately 0.6 mile (one-kilometer) deep northward-trending chasm located just above the center of the mosaic. The icy crust ofSaturn's moon Enceladus appears to occasionally belch up blobs of warm ice,findings that help explain the mysterious heat seen there, scientists nowsuggest. NASA's Cassinispacecraft "appears to have caught Enceladus in the middle of a burp,"said researcher Francis Nimmo, a planetary scientist at the University ofCalifornia, Santa Cruz. Roughly fouryears ago, Cassini detected heat flow by the moon's south polar region equal tosome six gigawatts, the equivalent of at least a dozen electric power plantsand at least three times as much heat as an average region of Earth of similarsize would produce. The region wasalso later seen to swiftly expel the element argon, in gas form, which comesfrom rocks decaying radioactively and has a well-known rate of decay.Calculations suggested it would be impossible for Enceladus to continuallyproduce heat and gas at this rate. The south polarregion of this moon was puzzling in other ways as well. Although heavilycratered plains in the moon's northern part appear to be as old as 4.2 billionyears, and a region near the equator known as Sarandib Planitia is between 3.7billion and 170 million years old, the south polar area appears to be less than100 million years old, possibly as young as 500,000 years. Now researcherssuggest the answers behind the mysterious heat, argon and youth seen in thesouthern part of Enceladus could come from deep inside the moon. 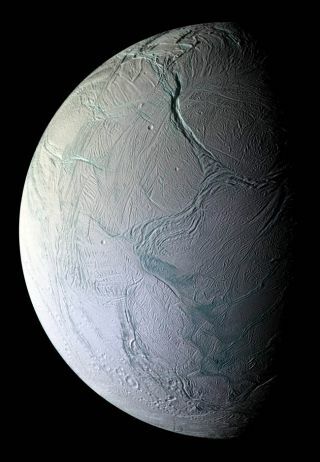 Their computermodel of Enceladus, adapted from one of Earth's crust, showed that heatbuilding up from the interior of the Saturnian moon could periodically bereleased in blobs of warm, light ice rising to the surface, akin to the risingblobs of heated wax in a lava lamp. The rise of the warm blobs would drivecold, heavier ice down into the interior, continuously renewing the surface. Keep in mind that"warm" is relative. Nimmo said the blobs are probably just belowfreezing, which is 32 degrees Fahrenheit, whereas the surface is a frigid -316degrees Fahrenheit. The computermodel suggests the churning periods last some 10 million years, while the quiettimes when the surface ice is undisturbed last about 100 million to two billionyears. These rare phases make up only about 1 to 10 percent of Enceladus' time. "Thesetumultuous periods are rare and Cassini happens to have been watching the moonduring one of these special epochs," Nimmo said. He noted that searchingEnceladus for areas where ice is converging or splitting apart could shed lighton where rising and sinking currents are. This new model"helps to solve one of the most perplexing mysteries of Enceladus,"said Cassini project scientist Bob Pappalardo. "Why is the south polarsurface so young? How could this amount of heat be pumped out at the moon'ssouth pole? This idea assembles the pieces of the puzzle." The argon thatCassini detected would also come up in these tumultuous periods. "If theargon was continuously coming out, it would all be used up in a few tens ofmillions of years, but it only comes out every so often, switching off andbuilding up and then coming out again," Nimmo explained. "It's not acoincidence this is happening at the south pole of Enceladus," Nimmo toldSPACE.com. "If you have hot blobs of rising ice, that will actually helptilt the satellite over." The fact thatEnceladus would pretty much look dead out of these burping periods "raisesthe question of whether something similar might happen someplace else in thesolar system that looks dead too," Nimmo said. "There are bodies thatdo have surfaces of different ages, so maybe they also have this episodicbehavior." Nimmo andgeodynamicist Craig O'Neill of Macquarie University in Sydney, Australia,detailed their findings in the Jan. 10 issue of the journal Nature Geoscience.